Instead of lugging around your entire camera collection, the Vojo 25 from Vanguard restricts you to a single DLSR body and just a couple of lenses. Personally, I prefer carrying light and being confined within one or two focal lengths my lenses provide me because it allows me to get creative with them and produce some interesting photos. 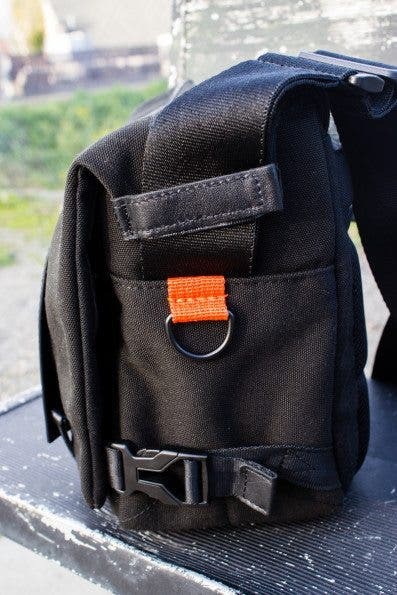 The convenient top zipper gives quick and silent access to your gear instead of having to be that awkward guy constantly ripping Velcro in a quiet environment. After over a week of real-world testing and putting the Vojo 25 through its paces, we’re ready to give you the full review after the cut. Tech specs taken from the Adorama page listing. The Vojo 25 shoulder bag is a compact camera bag designed to hold just a shooter’s essential setup. With enough room for only a single DSLR body and one or two medium size lenses, you won’t be able to bring every single piece of equipment along in this bag. The other pockets can carry your memory cards, a notebook, some pens, and other miscellaneous items. 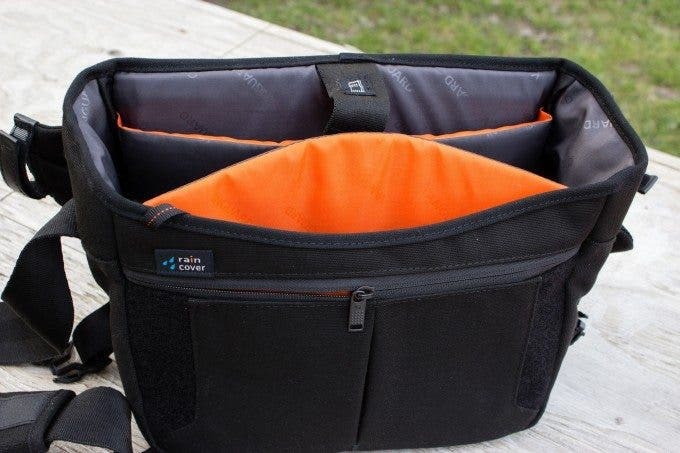 However, I felt that there should have been a few smaller slots for the smaller items within the pockets to keep things more organized.The designated tablet compartment can fit an iPad or any other tablet with an 9.7″ screen. It still protected my iPad mini but I could feel it slide around in the bag as I was walking. The zippered top-access feature was convenient whenever I wanted to quickly grab a shot, put my camera back, and move on. There seems to be a fair amount of padding along the removable inner-box to protect your gear from bumpy rides. When you have the inner-box installed, just make sure to fold its top cover back and keep it tucked away. The shoulder strap reminded me of an airplane seatbelt in both its look and feel. 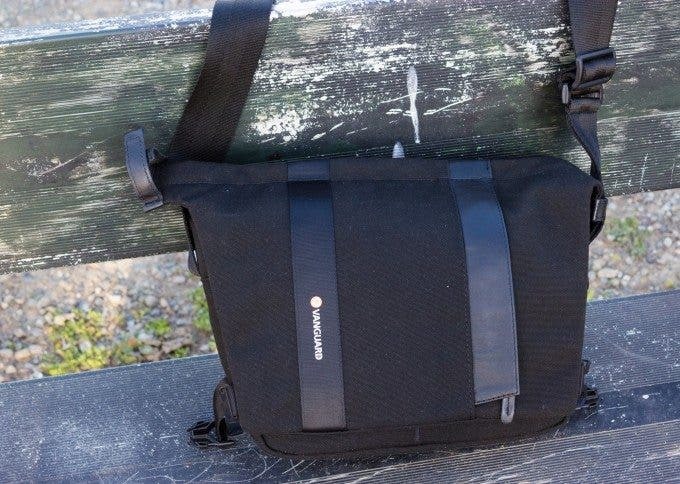 The shoulder padding is removable as it wraps around the shoulder strap and secures itself via Velcro. The shoulder pad feels stiff and isn’t as comfortable as I would have liked, especially when I have the bag filled to the brim with gear. The soft canvas material and the leather accents give the Vojo bag a nice aesthetic that I liked a lot. Through normal daily abuse on the road, everything in my bag was secure and didn’t suffer any damage. Although, the fabric seems to attract dust very easily, which I imagine can only get worse with time. The polyester material for majority of the bag’s inner lining and the entire removable-box compartment is smooth and allowed me to quickly take out and put back my gear as it just slid into place. The zippers open and close without getting caught mid-zip and appear to be high quality. 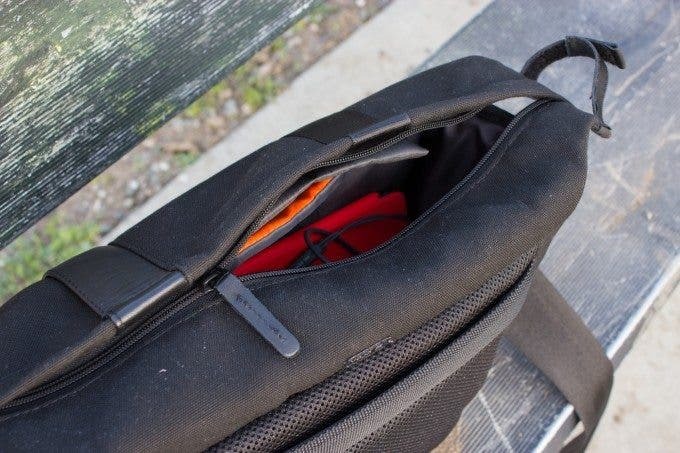 There’s nothing worse than shoddy zippers trapping your equipment inside your bag. The shoulder strap is smooth and comfortable to the touch. However, the shoulder pad could definitely have been better in terms of flexibility and comfort. The padding inside is too hard and unforgiving as it put a lot of strain on my shoulder when I had a lot of weight inside the bag. The removable-box compartment came in handy during photo walks because typically, I just bring my camera with a lens attached and head out. I found that I could keep my T3i equipped with a 50mm inside the bag without the removable box. It also let me pack a water bottle, my Moleskine, and some pens and pencils. With the side straps, I could adjust the size of my bag and make it much smaller and thinner, as if it was any other ordinary shoulder bag. A neat feature that I found useful was that along with the top access compartment, it also has a flip-up flap to quickly put everything into the bag before going out. This way, I was able to quickly and neatly arrange everything at home, and come shooting time, still have easy access to my camera. On the back of the Vojo 25, there is padding and ventilation similar to the kind that you’d find on a backpack. This was nice during the warmer days to keep the sides of my body cool. The padding is also a nice addition that makes this shoulder bag comfortable to wear during travel. The Vojo 25 shoulder bag is a very versatile bag that I found easy to use and convenient because of its top access feature as well as the removable-box compartment. I was able to take what I needed without having to carry a much larger and otherwise unnecessary bag. Although, after a longer walk with the Vojo packed with gear, the shoulder padding became an issue where I simply removed it altogether. 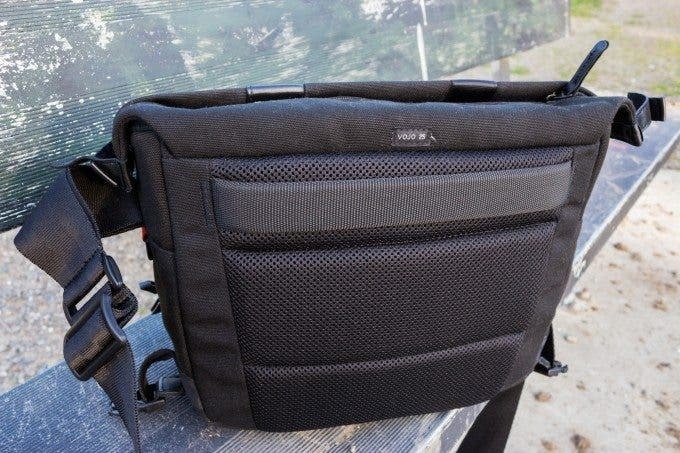 Overall, the Vojo 25 was a versatile and functional shoulder bag that shooters looking for a low-profile bag might want to consider.